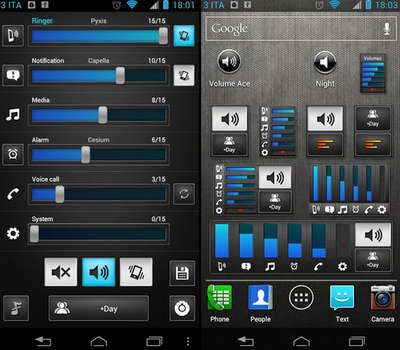 Use Volume Ace full version 3.4.2 to control every aspect of sound on your Android phone. With this application you can create and customize volume profiles instantly. - Create your own volume presets. Now each profile can save his own Ringtone, Notification and Alarm tone. - Scheduler : Schedule profiles to apply automatically at the time and day you choose. - Timer: Set a profile temporarily for x hours and minutes. Useful for meetings, movies etc. so you don't forget to turn off the "silent" profile. - Plugs : Automatically switch to profiles of choice when plugging Earphones, Desk or Car. - Set Mode(From widget too): Silent, Vibration & Normal. - Volume Locker: Prevent ringer and/or media volume to be changed outside the app. Languages available: Cs,De,Da,En,Es,Fr,Ko,He,It,Iw,Pl Ru & Tw. - Minor circular UI graphical issue. This is the fully functional patched version. * Tablets aren't fully supported.